Click here to View Great SAUCIER Product/Gift Ideas! Charles SAUCIER of St. Eustache, Paris, France (he was an organist/musician and is listed in the directory of Medieval Musicians of France in the early 1600's) married Charlotte CLAIRET. Their son, Louis SAUCIER, b. c1632 in St. Eustache, Paris, France emigrated to Quebec. There he married Marguerite GAILLARD widow DUPLESSIS, a "Fille du Roi." Marguerite GAILLARD: Gaillard dit DuPlessis. Married four times; (1) Duperon (2) 1644 Francois Prevost (3) 1670 Saucier (4) Michel Le Gardeur dit Sansoucy 1677 Census at Cote St. Michel (now St. Foy, Quebec, suburb) Francois Prevost 30; Marguerite Gaillard, sa femme, 30; Anne-Claude 2; 1 tete de betail, 12 arpents en valeur After the death of Francois, his property was inherited by his only son and sole heir Francois Michel Prevost (later Provost). The 1681 Census at Cote St. Michel: Michel Legardeur 31; Marie Gambier, sa femme, 42; enfants: Claude 13, (Marie) Madelaine 12, Michelle 10, Marguerite 9, Charles 7, Jean-Baptiste 6; 2 fusils; 4 betes a cornes; 2 chevaux; 30 arpents en valeur Omitted from this census was Jean Le Gardeur age 3 and the marriage brought two more children, Michel b.1681 died infant and Marie Marguerite born 1682 The last records of Marguerite Gaillard was in 1701 when she witnessed the marriage of her youngest daughter, Marguerite LeGardeur. Gabrielle SAVARY, one of the "Pelican Girls" at Mobile in 1704. Jean Baptiste SAUCIER: Jean was a recruit of d'Iberville in 1697. He served in the Hudson Bay and in the 1699 Gulf Coast Expedition. He settled at Mobile in 1702. He was a merchant who achieved some prosperity. He had some importance in the new colony at Mobile as he was awarded one of the larger plots of land. The story of the settlement and the settlers is told in Jay Higginbotham's "Old Mobile, 1702-1711," illustrated, maps, plat maps. Publ. Univ. Marie Gabrielle SAVARY: In 1704 Bienville wrote to France requesting that marriage-aged girls should be sent to the colony of Louisiana. Twenty-three girls of age were sent. They arrived aboard the Pelican that year. One of the girls was Gabrielle Savarit. Gabrielle married in Mobile at Fort Louis, had a family and was widowed about 1715. She remarried by 1718 was widowed by 1719-20 and married for a 3rd time. She is found in the census records in New Orleans in 1726 as a widow with 5 children. She is listed as the widow Saucier. On 30 Oct 1726 there was a list of persons supposedly residing in Louisiana about whom inquiry is being made in France. Gabrielle Savary was on this list. It was noted "this woman known in New Orleans as Madame Saucier." The Sauciers were owners of land in New Orleans, by grant, in 1731. They are listed as landowners on the Gichon map. There is a succession record in New Orleans for Gabrielle. She died 1735. 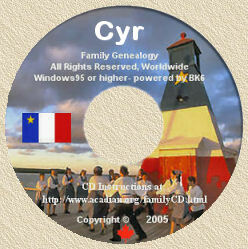 For a more complete list of descendants see Julien Saucier's page which uses data from my GEDCOM.